You don’t see many short stories dealing with spy craft. There are a number of reasons for this, both practical and theoretical, but the primary one arguably would be that the format of the short story does not lend itself well to the intricate and complex storylines that are part and parcel to espionage fiction. This is not always true, as Otto Penzler points out in his introduction to AGENTS OF TREACHERY, an original anthology of short spy fiction by contemporary masters of the genre written at his request. Such notables as Ian Fleming and Peter O’Donnell, for example, each wrote and published a collection of spy stories featuring James Bond and Modesty Blaise, respectively; for the most part, however, such collections have been few and far between. That is but one reason why AGENTS OF TREACHERY is so special. There are other reasons of course, one of which is the number of A-list participants that Penzler has brought to the table to serve up what is indeed a bountiful feast of espionage fiction for the eye and mind. While the majority of the stories are set in the post 9/11 era, the backdrops range from World War II through the Cold War of the 1950s and 1960s (fertile ground, indeed) to tomorrow morning. Each and all of the selections here have something to recommend them, so much so that it is difficult to pick a winner. In fact, how does one even try when presented with stories by David Morrell, Gayle Lynds, Lee Child, Richard Hunter, Joseph Finder and Andrew Klaven, among others? Lee Child’s “Section 7(a) (operational)” is a narrative devoted entirely to what happens before the subject matter of the story actually occurs. It is far afield from his Reacher universe, but even the most rabid Reacher fan will not mind one bit. If you like stories dealing with paranoia, Joseph Finder’s “Neighbors” and Andrew Klaven’s “Sleeping With My Assassin” are just the berries. Finder’s offering, as one might expect from the title, deals with the suspicious-looking folks next door who just might be watching you as you watch them. Klaven’s story, on the other hand, concerns a long-existing sleeper cell whose members, one by one, seem to be taking untimely dirt naps. Is it by accident or by design? And if the latter, what is the instrument of delivery? This one will keep you up nights. On the subject of enhanced interrogation, “The Interrogator” by David Morrell offers up a view of the effect of torture not only upon the subject but also upon those conducting the session. No matter what your position happens to be concerning methods of gathering intelligence, and the limits on same, you will find much to contemplate here. If, on the other hand, you want a straight-up war story that shows how military intelligence affects battlefront missions, look no further than “Casey at the Bat” by Stephen Hunter. Set during the latter half of World War II, “Casey at the Bat” demonstrates why even in wartime so-called allies are best kept at arm’s length. And while “Max Is Calling” by Gayle Lynds is not a traditional war story, per se, it is a story about brothers in arms, and how one instructs and teaches another, however unintentionally. It will remain with you long after you turn the last page. As I said, though, it’s tough to pick a winner among the stories. 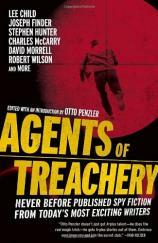 My favorite one, interestingly enough, is “The End of the String” by Charles McCarry, which opens AGENTS OF TREACHERY. McCarry, a Cold Warrior, was writing for a living well before I could hold a pencil properly; his story describes the events leading up to an attempted coup in a mythical African nation. Set in the 1950s, it describes events that could easily have happened this afternoon. What draws one into the narrative, however, is the unforgettable imagery that informs McCarry’s prose from beginning to end. A close second in the story sweepstakes is the ironically titled “You Know What’s Going On” by Olen Steinhauer. Told from the alternating viewpoints of several of the characters in the story, the many facets of a plan to take down a terrorist group are gradually revealed, as well as the ulterior motives of at least one of the participants in the plot. AGENTS OF TREACHERY is a keeper, not only for its selection of authors (and I haven’t mentioned them all), but also for the quality of the stories in a genre that doesn’t lend itself easily to limited word count. It is the perfect volume for readers intimately familiar with the spy novel as well as those who seek to go beyond the works of Fleming and Ludlum.